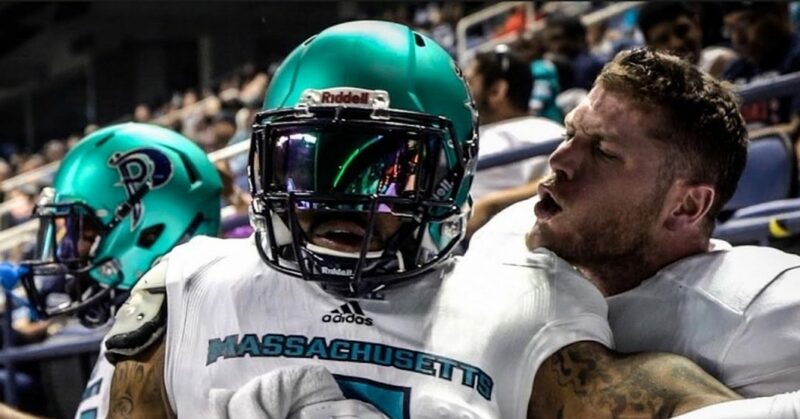 The Massachusetts Pirates are putting in work on the field and all that hard work is translating into the all-around growth of the brand new arena football franchise. With a record of 4-1, the team grabbed a share of first place with victories against last year’s National Arena League Champions the Jacksonville Sharks, as well as another contending team the Columbus Lions. It has been a long road coming for the newly-erected franchise, and Team Player-Relations Director Scott Prusak is impressed and proud of how much the team has grown. Jawad Yatim, the President of the Pirates, is dedicated to winning and is happy with how his team has developed. When it comes to success on the field, Yatim said that it comes from the explosiveness and the experience of the players. As one of the oldest teams age-wise in the National Arena League, the experience has helped with the grooming of the young players and according to Yatim, they have been doubling as coaches on the field. The team is neck and neck with the Carolina Cobras as both teams have the same record and are at the top of the standings. The only loss that the Pirates have sustained this season came against the Cobras and the two teams will face off again on May 19. There is a lot going on for the Pirates off the field as well and Prusak said he is very excited about what’s in store for fans at the DCU Center and at autograph shows around Massachusetts. During this charity event, anyone who donates $25 will get to meet Pirates players and staff to get a picture of the team and have it signed. The lucky first 25 will get a picture signed by former Patriots offensive lineman Joe Andruzzi himself. The Pirates next face off against the Maine Mammoths on Saturday, May 11 at the DCU Center in Worcester. Kickoff is set for 7 p.m.